Like many of his days as an electric co-op lineworker, Larry’s day actually started the night before. He was getting ready for bed when a woman reported her power was out. It was Larry’s weekly overnight to be on call, so the co-op truck was already in his driveway. He drove it to the woman’s house, identified a problem in the base of the meter, installed a temporary fix until an electrician could get out the next day, and returned home two hours later. By 7:30 the next morning, he would report for work at the co-op office. 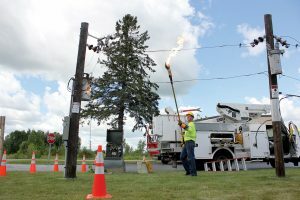 Larry’s like a lot of electric utility lineworkers, said John Dvorak, director of safety and loss control for the Iowa Association of Electric Cooperatives. Dvorak also serves on the membership committee of the National Utility Training and Safety Education Association. In truth, Larry isn’t like a lot of lineworkers—he is a lot of lineworkers. He’s actually not a real person, but a combination of all the real people I met doing interviews for this story about a typical day in the life of a lineworker. Following Procedure What I discovered in my day at the co-op was a group of people who carefully and deliberately follow the rules of an elaborate system that lets the rest of us make magic by flipping a switch. It’s a system made up of little pieces of hardware, big trucks, and small and large tools. Larry started his day sitting in a room with the rest of the lineworkers, leafing through stacks of paper—checklists, maps, work orders—planning the day’s work. The group compared notes on similar jobs, asked who was familiar with the area they were headed to, and analyzed the finer points of last night’s college football game. In addition to taking time to coordinate the plans and paperwork, these guys (there are a few women among the more than 15,000 co-op lineworkers around the country) need to keep track of a lot of equipment. Neatly organized shelves in the warehouse hold saws, drills, climbing hooks, insulated work poles, trash cans, and binoculars. The right equipment needs to be in the right truck for the day’s job. Lineworkers need to be wearing safety gear or have it close at hand—hard hat, safety glasses, fire-retardant uniforms, steel-toed shoes, regular work gloves, hot-line safety gloves. And there was one more thing keeping the crews from driving off to their first jobs, probably the most important reason of all for the workers’ careful habits: the weekly safety meeting. The co-op’s safety coordinator opened the meeting. She said that while catastrophic contact with electric current is always a top concern, today’s meeting would focus on avoiding “slips, trips, and falls that can cause very big issues.” The group members talked about being aware of their surroundings, avoiding distractions, properly lighting work areas, and watching out for each other even if it means they have to tell co-workers they’re not following proper safety procedures. The meeting ended and as the crews organized their truck convoys, I saw something that struck me as amazing in how simple it was. Just to make sure I wasn’t making too big a deal out of a routine courtesy, I mentioned it to Corey Parr, vice president of safety and loss prevention with the company that insures most of the electric co-ops, Federated Rural Electric Insurance Exchange. Parr said that tap on the shoulder also reveals an important myth about the danger of line work. And maybe those safety rules are working. 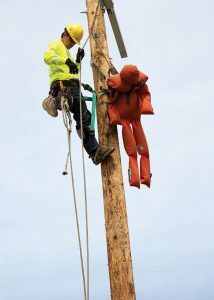 From 2006 to 2015, co-op lineworkers reported 53 injuries from falls, including falling off poles. In 2016, that number was zero. By mid-morning, the convoy was ready. Three lineworkers drove three trucks: a service truck, a bucket truck pulling a trailer with a large spool of wire, and a digger truck with a huge auger on top and pulling a trailer carrying a backhoe. They headed across the county for the day’s job—moving a ground-mounted transformer 500 feet up a hill, closer to an underground connection to a new barn. “It’s going to be muddy out there after the rain we’ve had,” Larry said. “When you’re working on underground connections, mud is not your friend.” We neared the site by late morning. To avoid interrupting the field work, the team stopped for an early lunch at a truck-stop McDonald’s. Over burgers, I asked Larry about his training and his typical day. I asked Larry what people should know about lineworkers. Larry said it took him five years of experience and study to reach lineworker status, including learning basic algebra and math to calculate tension on wires, construction angles, and adjusting transformer voltages to the job. When the caravan arrived at the work site, the crew faced roadblock number one: how to manage a right turn into the driveway with the large trucks and trailers without ripping the mailbox out of the ground. They drove further down the road to a spot where they could turn around, allowing a left turn onto the property. The trucks drove up the packed, crushed-rock driveway, avoiding the soft ground on either side. The crew’s first move on the ground was to change from leather boots to rubber boots—I watched from the side, taking notes, my tennis shoes sinking into the mud. The three lineworkers then gathered near the front of one of the trucks for what a lot of co-ops call a “tailgate meeting” and this co-op calls a “job briefing.” They opened a metal-clad clipboard to read through a stack of forms, noting the address, cross street, job and account number—that way, in case they have to call in an accident, location information is quickly available. All three men signed the form. They broke their huddle and de-energized the lines they would be working on, calling in to let the office know the power had been cut. The next step was to use the backhoe to dig around the new connection pipes sticking out of the ground, making room for the ground-mounted transformer. When the backhoe finished digging around the new transformer location, the crew drove it down to the old transformer site. The crew unhooked the electric connections, then chained the transformer to the backhoe’s loader bucket to be carried up the hill. But then came roadblock number two: The backhoe wouldn’t be able to make the short drive without sinking into the mud. So the large trucks were carefully backed down the driveway, clearing the way for the backhoe to be driven up the hill on firmer ground. Two of the crew pulled new wire underground, then methodically cut and spliced the two-inch diameter wires into the transformer box. They secured the connections before cleaning up the work site and backing out of the property. On the return trip, the convoy visited the truck stop to top off the gas tanks. Back at the co-op, the crew checked the paperwork for the next day’s jobs, then stocked the trucks with the equipment they would need for an early start the next day. Before we said goodbye, I asked Larry what he liked about his job. I also noted that everything they did that day seemed to take a long time. Larry told me he likes that he has a good job that lets him provide for his family. Paul Wesslund writes on cooperative issues for the National Rural Electric Cooperative Association, the Arlington, Va.-based service arm of the nation’s 900-plus consumer-owned, not-for-profit electric cooperatives. Working around high-voltage infrastructure requires close attention to procedures and deliberate habits of safety, but we’ve never met a lineworker who was afraid of electricity; anybody who was probably wouldn’t last a week in the job. 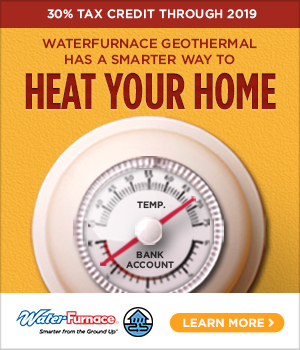 It’s fairly simple: If you know what you’re doing and pay attention, all the time, you can control electricity. If you don’t know what you’re doing or let your mind wander, it’s better to stay away. Construction and maintenance of power lines is demanding but not scary, which doesn’t mean there aren’t plenty of scary things lineworkers or other co-op employees need to be aware of as they carry out their duties. We’ve heard about a co-op employee on a field assignment who was greeted at the front door by a man armed with a revolver. This employee is a calm fellow with a friendly manner, which likely helped keep things from going wrong. We’ve heard about lineworkers coping with pit bulls located perilously close to where they needed to carry out an assignment. We even recall the accounts of rifle fire directed at occupied vehicles, evidently by people who disliked the construction of a new transmission line. The National Rural Electric Cooperative Association has designated April 9 as Lineworker Appreciation Day. It’s a day to recall that ice, snow, rain, wind, snakes, bugs, and heat aren’t the only things those faithful workers might run into, as the everyday heroes who keep our lights on.